DIN Standards are invented for a variety of components including industrial fasteners as DIN 976 Stud Bolts. DIN 976 Bolts are manufactured from Carbon Steel, Stainless Steel Grade A2 or A4, Brass, Alloy Steel, Plain Steel, Ordinary alloy steel or many other materials. 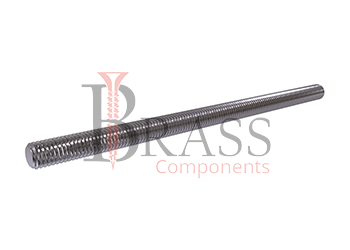 DIN 976 Metric Thread Stud Bolts are available in a wide range of sizes, shapes and materials. Strength Class 4.6, 5.8, 8.8, 10.9 and 12.9. High Yield Strength and Anti Corrosion Properties. Complies with GOST 22032, DIN 975, GOST 9066. Tension is necessary to ensure the immovability of threaded stud connection during operation. 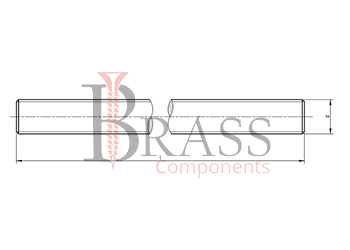 Nut is used to extend structure of the DIN 976 Bolts. The Installation of DIN 976 Bolts begin with the fastening of the anchor in the wall, then the material of the required length and thickness is cut. Can be fixed and conjunct in accordance with the recommended load. Ensure the reliability and immovability of joints and connections. Intended for use with light metals like Aluminium. Used for Building up of fixing structures with metric thread, air suspension, ventilation system and ceiling slabs. For successful installations of work in fastening. Used for connecting various parts together with different types of threads, nuts and other parts. Used to tighten or connect parts and structural elements in construction and various industry in conjunction with washers and nuts. Used in different industries for building up the elements of metal structures. We manufacture DIN 976 Bolts as per Custom Specification and export in Finland, Jersey, Spain, Switzerland, Ukraine, Austria and other European Countries. For more Information, Please Contact Us or Inquiry Now.